With hundreds of so-called health products on the market, it can be overwhelming when attempting to discern the good products from the bad. Most specialists advise sticking to products with ingredients that you can actually pronounce, leaving most of the chemical-ridden products behind. By purchasing foods and supplements that are derived from natural ingredients, you are investing in your health while allowing your body to function at an optimal level. 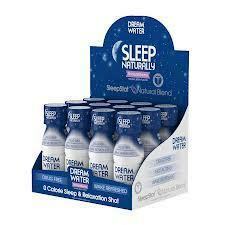 Dream Water fully supports this natural pledge, with their commitment to natural ingredients setting them apart from all other sleep enhancers and supplements, as their unique formula provides a healthy solution to better sleep & relaxation. Dream Water’s three key ingredients have been reviewed by Natural Standard - a widely renowned empirically-based resource of healthy and all-natural substances. 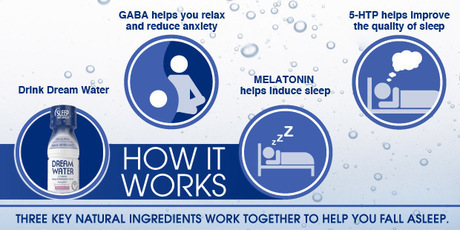 Dream Water® contains three natural ingredients that should occasionally help transport you to a sound and restful sleep, including GABA, Melatoninand 5-HTP (Tryptophan) to help one relax. Dream Water works by helping you to relax at bedtime. Take it right before you get into bed, and allow yourself to relax. You should find yourself drifting right off as your anxieties are eased. After falling asleep, you will sleep blissfully, and deeply. Dream Water will improve your quality of sleep and you will wake up refreshed. I received samples of Dream Water to review, in nighTEAnight which has a natural citrusy flavor. When life gives you lemons we suggest you say, "forget the lemonade, I'd rather take a nap!" A twist of sweet summer lemon, and a hint of tea, adds a crisp, clean citrus flavor to this refreshing water and an easy way to lull yourself to a perfect sleep. 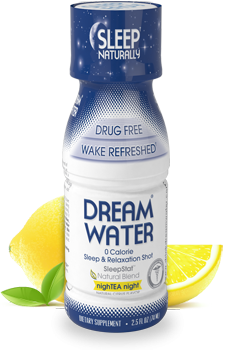 This 2.5 ounce Dream Water Shot is great for people who want to fall asleep with very little liquid. The 2.5oz Dream Water® shot bottle is conveniently designed to pass through airport security. Traveling with your Dream Water® is made easy so you get the sleep and relaxation you need. Dream Water® is available in Snoozeberry, nighTEA night and Paradise PM flavors. My Experience: I have suffered from bouts of insomnia ever since I became a mother, because it is in my nature to worry about my kids. (Isn't that how it is with all mommies?) There was a time when I was prescribed a medication that turned out to be very addictive. Over the years, I got addicted to it and my body did not know how to fall asleep without it. It took me a year to wean myself off of that nightmare drug. I will never again use a presciption medication for sleep. I wanted to try Dream Water because it is 100% natural and drug-free. It came to me at a good time because I was having some sleepless nights. I waited until bed time and drank my Dream Water® shot right before bed at 11pm. After 10-20 minutes I felt a sense of calm as my body started to relax. What a comfortable feeling! Before I knew it I was alseep and did not wake up until about 7am. I had actually slept peacefully the entire night through. It felt so refreshing! I am definitely keeping Dream Water in my medicine cabinet from now on. Interesting! I'm glad it worked for you. It's reassuring that it's all natural. I can't remember the last time I had a good nights sleep. this is all about the herbal treatment for anxiety. Dream water fully supports this natural pledge, with their commitment to natural ingredients. This water contains three natural ingredients that's why you should take restful sleep. I read the https://www.facebook.com/edussoncom/ than I know about this water.